Summer in Boston doesn’t always arrive in June like it should. With a sunny, 75-degree weekend, though, we’re almost there! This dish has warm-weather flavors in every bite with lots of sweet corn (frozen from last summer) and fresh basil. I added chicken sausage to make the meal more filling, but you could leave it out to make the dish vegetarian. When I started eating for acid reflux, the new pasta prep methods were so tough to get used to. Pasta needs to be dressed lightly, as too much oil leads to heartburn; tomatoes, onions, and garlic are all forbidden. When I saw this recipe on the Iowa Girl Eats blog, I knew it was perfect for The Low-Acid Kitchen. I used gnocchi because their texture lends them to being enjoyed plain rather than smothered in sauce. If you’re looking to impress a dining companion, I recommend using regular gnocchi in this dish; the color contrast with the sausage would look nicer. 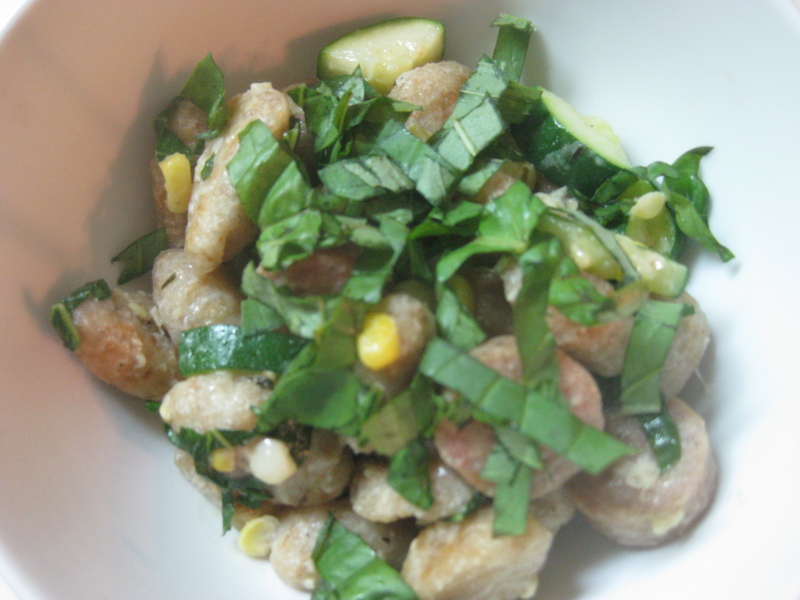 In these photos I used whole-wheat gnocchi to get the extra fiber. You will enjoy the meal either way! Heat olive oil in a large skillet over medium-high heat. 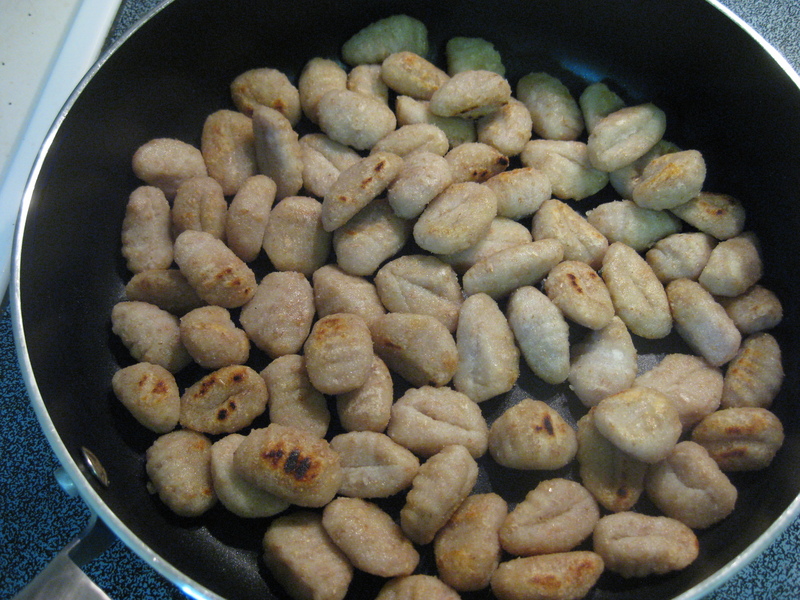 Add gnocchi then spread in one layer and saute undisturbed for 3-4 minutes, or until golden brown on the bottom. Toss them and continue sauteing at medium heat for 3-4 more minutes. Remove from the skillet and set gnocchi aside. Meanwhile, if you’re using the sausage, heat a small skillet over medium heat. Chop the sausage and saute for 8 minutes, stirring frequently. 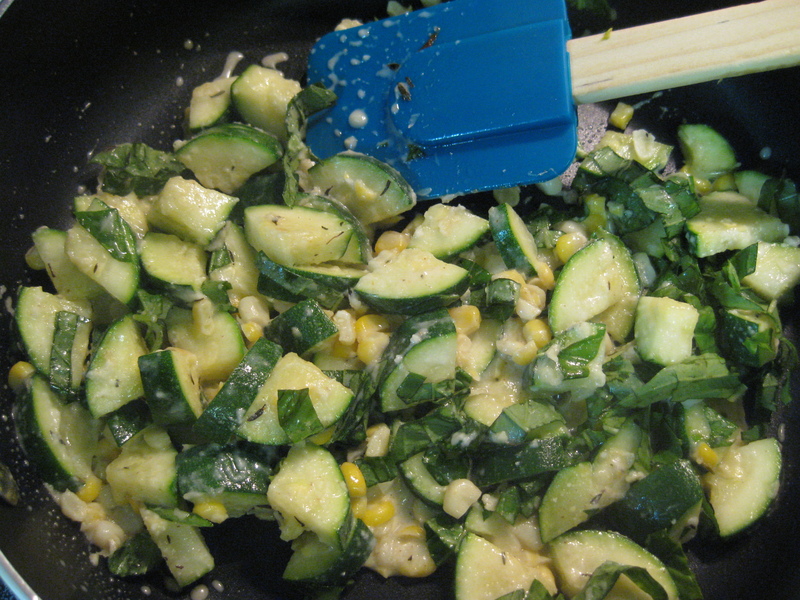 Add the lemon oil to the gnocchi skillet at medium-low heat, and then add the zucchini, corn, onion powder, thyme, and coriander. Saute for 3 minutes, stirring frequently. Season with salt to taste, add half of the basil, and saute for 30 more seconds. Turn off the burner. Add the broth and parmesan cheese to the corn mixture and stir to combine. 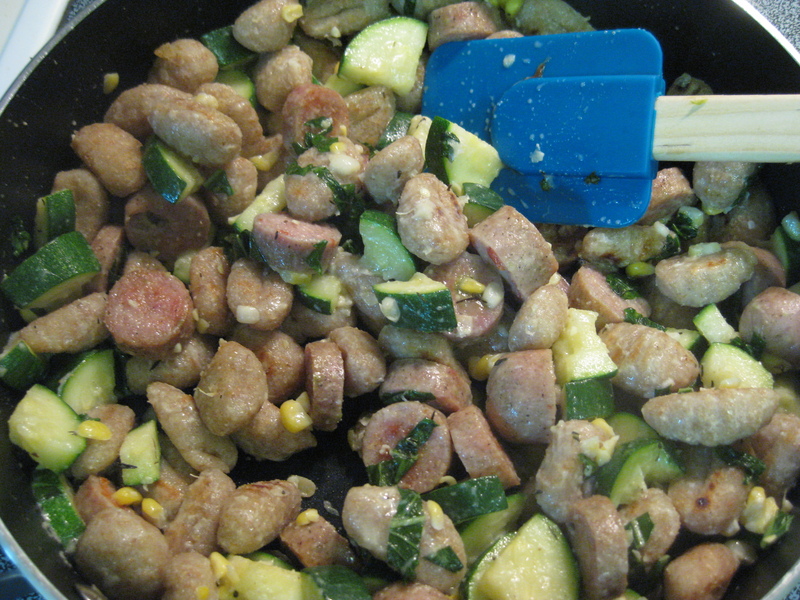 Add the gnocchi and sausage and stir, adding more cheese to taste. Serve topped with the remaining basil. To reheat leftovers, add a spoonful of broth (or water) to each portion and heat in the microwave. Top with parmesan cheese and more fresh basil, if you have it.